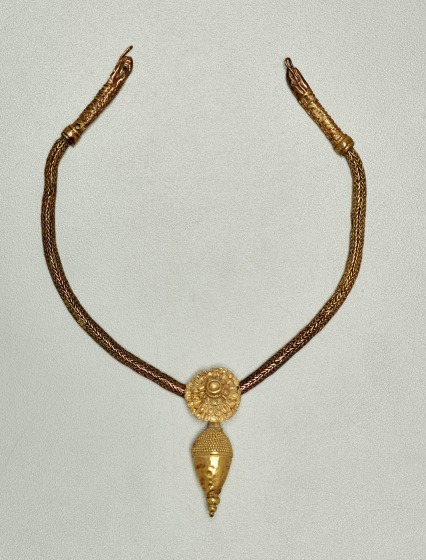 The heavy, multiple loop-in-chain of this ancient Greek necklace terminates at both ends in a snake's head, with a long collar on which the snake's scales are indicated in filigree. On the top and on the side of the collars, the scales are arranged vertically, underneath horizontally. The chain and the snake finials are held together by rivets. 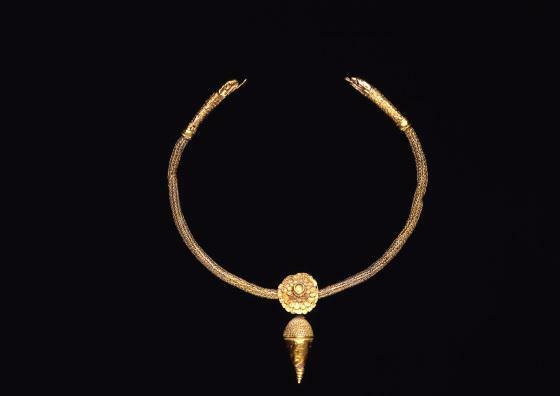 Attached to the chain is a rigid pendant consisting of a large rosette, fitted on the back with a loop, and an acorn. The front of the rosette consists of three layers of sheet gold, one above the other. The top layer is smaller than the one underneath, which in turn is smaller than the lowest one. The petals are outlined with fine beaded wire. A circular setting, its base surrounded by a beaded wire, forms the center of the rosette. It might have held an inlay. The acorn pendant, a large oval bead, draws to a point at the lower end, to which are attached three granules of diminishing size. 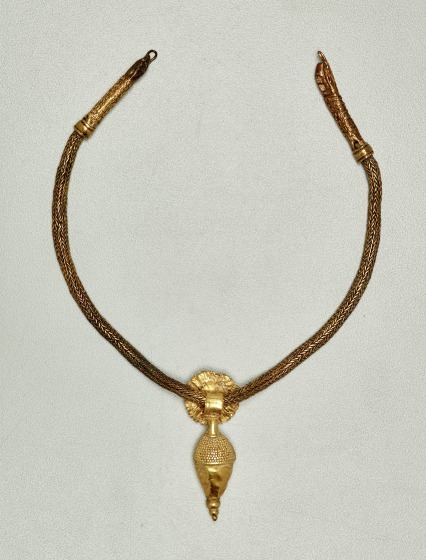 The upper part of the pendant is densely covered with slightly flattened granules; the lower part is left plain. 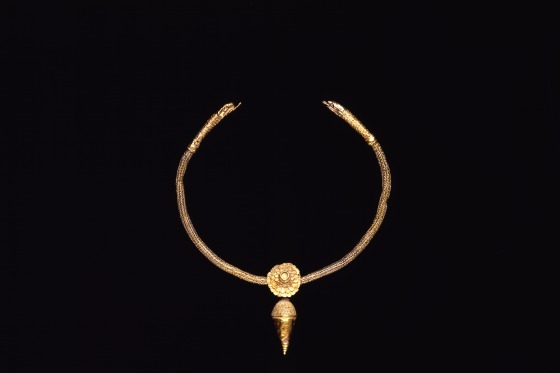 Barbara Deppert-Lippitz, Ancient Gold Jewelry at the Dallas Museum of Art__ (Dallas: Dallas Museum of Art in association with the University of Washington Press, 1996), 136.